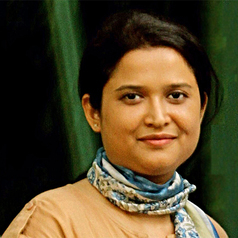 Esha Madhavan is a Union Grants Commission PhD Research Fellow at the Department of Politics and Public Administration, University of Madras, India. In her PhD thesis entitled ‘Internet and Democratic Politics in India: a study from communication perspective’ she investigated the public sphere potential of Internet in the context of India’s democratic politics. Her interests include conceptualising and measuring Democracy. As a Visiting Fellow at the Sydney Democracy Network, Esha Madhavan is conducting research into the indexing of deliberative decision making in civic life. The research is centred on the development of the Public Sphere Deliberation (PSD) Index aimed at measuring, determining and predicting the democratic value of citizen deliberation. The research focuses on the context of India’s democracy; the internet as tool of democracy; the growing significance of citizen deliberation in shifting attention towards self-governance and civic problem solving, scrutiny of arbitrary power beyond the scope of elections, and institutional innovations within monitory democracy; and will attempt to achieve empirical analysis of citizen deliberation through multidimensional aggregated data analysis.